Artistic and well-made, it’s a good movie, with fun characters. but tends to get slow at times, and is sometimes a struggle to understand what everyone is saying. 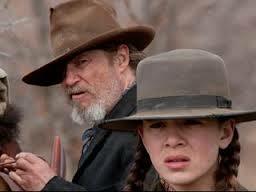 True Grit is a pretty cool movie. like many coen brothers films, it gets better each time you see it, and is slowest on the very first viewing. the plot is pretty straight forward, about a teenage girl who hires an ex-marshall turned bounty hunter to go after the man who killed her father. this girl, mattie ross, travels with the bounty hunter (rooster cogburn, played by jeff bridges), and has adventures with him and the man who joins up with them (mr. labeef, played by matt damon.) there is great attention to detail in this movie, and sometimes it’s more than it needs to be. the characters are fun to be around, but some of them such as cogburn and chaney, (the man they are after), can be difficult to understand at times. still, trying to figure out exactly what they are saying becomes some of the fun of this movie. it’s a good film, and is very artistic, but not for everyone. still, as far as filmmakers go who are good at art and storytelling, at the same time, these guys do it better than anyone else. there’s a whole bunch of directors who sacrifice story for art (terrence malick, baz luhrman, michael mann), and the coen brothers consistenly prove that they know how to handle both. true grit is a prime example of this. 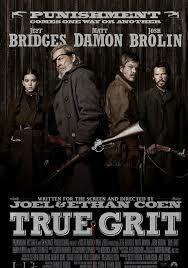 True Grit is a good, interesting movie by the coen brothers, and true to form, it is artistic as hell. that’s one thing that can absolutely be said about every coen brothers movie. these guys are smart and they are master painters and this movie is just about as beautiful to look at as anything else they’ve done. it also sounds amazing, meaning the music, street sounds, and even dialogue are all fantastic. but the dialogue also has a major problem going for it, which is that many of the characters are hard to understand. these character include both rooster cogburn (jeff bridges playing the main character of the movie) as well as mr. Laboeuf, (played by matt damon), and also tom chaney (josh brolin). each one of them speaks in a very difficult manner for understanding, and on the one hand that’s interesting, the way they each speak so differently, but on the other it’s often difficult to know what they are saying. especially when they carry on conversations talking with the vocabulary and slang that they really would have used in the old days, using words of which we sometimes need to figure out the meaning. and to make matters even worse, these characters tell lots of stories and talk fast. when we meet rooster, he is on the stand in a witness box at a courthouse telling a lengthy story about shooting some men. and it is a running joke of this movie that laboeuf never shuts up, even when he has nearly bitten through his tongue. the movie has a nice storyline about how this young girl of fourteen , mattie ross, hires a bounty hunter to go after tom chaney, the man who killed her father. ross is a tough cookie, and in her early scenes we see her out hustle a hustler over some horses that her father was in the process of purchasing from the man before they were stolen. she is quick talking and smart and knows how to get her way and make grown men look like fools. there is great humor here, and the actress that the coen brothers found for this movie, hailee steinfeld, is pitch perfect. i don’t know how they found her, but the coen brothers have always been magic makers, and this movie is no exception. it takes a while for mattie and cogburn to get going off on the road, and a good deal of convincing. mattie has to see cogburn about three times before he will actually go. she also deals with that horseman hustler a couple of times, witnesses a hanging, and even meets laboef. all of this sets up not only the characters, but also the town and environment. for example, during the hanging, we get to hear some last words from each man being hung, except for the indian, who they refuse to even let speak. there will be other encounters with indians later on and this treatment of them will be repeated, like when cogburn visits some indian children and kicks them off the stoop both when he enters and then leaves their house. but the problem with taking so much time to develop tone, environment, and character, even before the real story of the hunt gets started, is that the movie becomes incredibly long. at two and a half hours, it’s not easy to get through a long movie, especially one that often feels like it’s moving kind of slow. it isn’t until nearly an hour into the film that the three leads are actually on the road together, as mattie follows laboeuf and cogburn, determined to see that she gets what she paid for. both hunters are after the same man and have decided to join forces to bring him in, but mattie has paid cogburn to make sure chaney is hung here, and not in another state, and that much is important to her. it’s an interesting debate, as cogburn insists that it makes no difference where he is hung and that mattie can tell chaney that he’s being hung because of her father, herslef, if she wants to. once on the road, it does take a lot of time before anything that resembles action starts to happen. first there’s laboeuf and mattie arguing to the point where he starts spanking her with his belt. then he and cogburn have words and end up going their separate ways. now it’s just mattie and cogburn as they come to that indian house, then find and cut down a man hanging from a tree, and after that meet a local dentist wearing a bearskin to stay warm. it’s all interesting in a johny depp- dead man, kind of way, but it’s not enough to really hold our attention in place, without a hint of action here or there. we finally get that action we’re looking for when they come to a cabin with smoke coming from the chimney and have dealings with the two men who are inside. these men are undecided on how they want to handle cogburn’s visit and torn up by the way they differ in opinion. things end up getting pretty out of control, and next thing you know both laboeuf and chaney’s gang are all showing up at the cabin to see what’s going on. the real action of the movie doesn’t take place until the ending. there is a great gun battle, and even some fun moments before that involving barry pepper as the great lucky ned pepper, and his gang of misfits. even tom chaney doesn’t seem all that bad, as he tries to understand a little bit about why mattie hates him so much. and rooster does get to deliver with some gunfire and show off his skills in a wonderful shootout climax. True grit, the remake of the john wayne movie that won him an oscar, is a very well-made film. the coen brothers know they have a strong plot to work with, trying to be more true to the book than the wayne movie was. here they have the story of a girl who hires a bounty hunter and then goes out on the trail with him and experiences everything that comes their way. and all of the establishing before they actually get out on the trail really does help setup what is to come. the scene of rooster on the stand, and then the scene of mattie out hustling the horse salesman, happen to be the best two scenes of the movie, but neither one of them, interesting though they may be, really moves the story along at all.